This educational series is intended to give the Bay Area audience an opportunity to form a deeper understanding of Chinese music and performing arts, and to meet some accomplished artists "up close and personal". At each session, a musician or artist will give a talk on his or her area of specialty, which could be a Chinese musical instrument, a regional style of dance, or certain aspect of performing arts. A question and answer session follows to foster interactions between the artist and the audience. Professor Ding Chengyun was from Dengzhou, Henan Province. He is a famous music scholar and is most noted in the realm of “Guqin”. From a very early age, professor Ding developed his love for Chinese arts and culture and started playing qin and zheng under the tutorage of his elder sister Ding Boling. 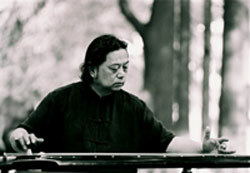 Later he became a pupil of guqin masters, Gu Meigeng and Zhang Zeqian. He graduated from the Department of Chinese Instruments in 1969, and taught in Henan University (lecturer, 1972, associate professor, 1986, professor / head of department, 1992, Director of Graduate School, 1998). Currently he is a professor of Wuhan College of Music, and Director of Changjiang Traditional Musical Culture Center. 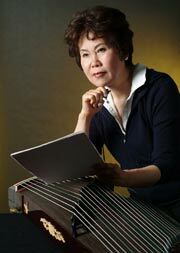 He is also a visiting professor of Taiwan Nanhua University, and Chinese College of Music. He is a member of Chinese Musician’s Association, Association of Famous Chinese, and Director of Boya Qin Association. Guqin, also known as qin or seven stringed instrument, is one of China’s oldest string instruments. It was already popular among ancient gentlemen, scholars, and saints over 2500 years ago. It was said Confucius consoled himself singing and playing this instrument during his low and sad period roaming the kingdoms of Chen and Cai. Se dates back to even before the guqin, and is considered an extinct instrument. Prof. Fu is one of only a handful of people in the world who know how to play the se. This will be a rare opportunity to experience the legendary harmony attributed to the guqin and the se.